Baltasar's Cavalcade in El Puerto de Santa María. It is celebrated every January 5 (the day preceding the feast of Epiphany) in the evening. When the night comes the children must go to bed early after cleaning their shoes and the following morning they have the gifts of the Magi that they have requested before in a letter. According to this tradition, the children who have behaved badly during the last year receive coal rather than candy, though (as in the case of Santa Claus) this is not a frequent occurrence. They might get coal candy, though. The, great cavalcade of Madrid is retransmitted live on TVE 1 (the public Spanish broadcaster) every year. The cavalcade of Alcoy is the oldest in the world and is a major draw of international tourism for Spain. 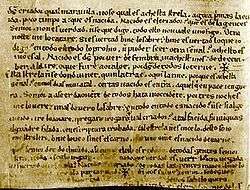 Codex of the Auto de los Reyes Magos. In Poland the first Cavalcade took place in 2008 in Warsaw. In 2016 the parade took place in over 450 Polish cities. Wikimedia Commons has media related to Cavalcade of Magi.